Welcome to the Choose Your $50 Gift Card Giveaway! Co-Hosted By: Tales From A Southern Mom, Sweet Southern Lovin, My Silly Gang, An Exercise in Frugality, Romania and Missions, The Breezy Mama, Deliciously Savvy, Delightful Ideas, Fun Fierce Fab Beauty Over 50 and Love Me Some Coupons! One lucky winner will receive a $50 Gift Card of their choice. Disclosure: This blog received no compensation for this post. Simply Southern Couponers is responsible for prize fulfillment. This giveaway is in no way sponsored, endorsed by, affiliated with, or associated with Facebook, Twitter, Pinterest or Google or any other social media platform. 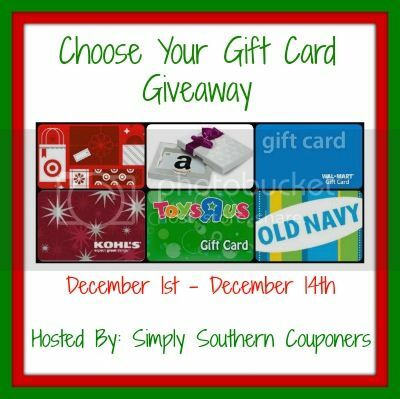 If you have any questions please email Jennifer at simplysoutherncouponers@gmail.com. Nice give away, good luck to y'all. This is an awesome giveaway! Great for the holidays too! Lovely Giveaway :) C, xoxo.